As we start the official grilling season, one can think of many foods that epitomize a backyard BBQ. One favorite in my family is unquestionably the classic burger. Despite the many creative twists you can have, I find that you often have better results with less complexity. As for preparation, there are many ways to save time and still end up with an amazing burger. This year we introduced a great product called the Weber Essentials Burger Kit which helps you on your journey to Burger Brilliance! 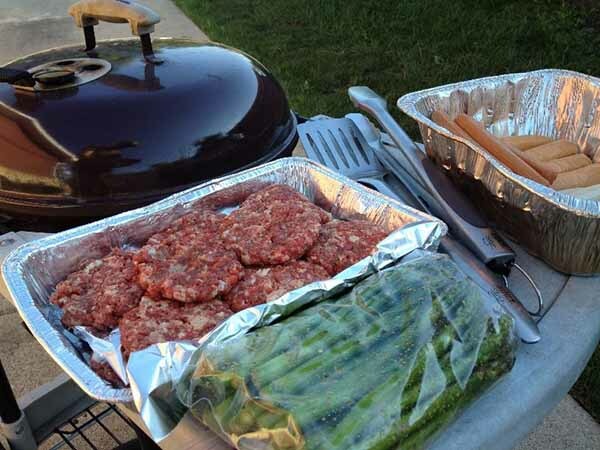 It includes one Burger Press, one Weber Essentials Stainless Steel Spatula, one Weber Gourmet Burger Seasoning shaker and an amazing set of Quick Tips. My kids love helping me cook in the kitchen and grill outside. More recently we have selected recipes from a weekly meal delivery food subscription service. The prep and cook steps are outlined and illustrated which helps save us time. For the kids, opening the box to see the new meal is an event in itself. When preparing to make a burger, first, you need to know your meat. Recently I had my butcher grind my preferred combination of boneless beef short rib with Applewood smoked bacon. Ribeye or sirloin also work well. I almost always prefer to grind my own, but sometimes the process is more than I have time for. Many grocery stores will do custom grinds for you while you wait, as long as you tell them exactly what you want. Adding salty, smoked bacon gives the mix another dimension of flavor. You can also add spices to the mixture and the Gourmet Burger Seasoning is a great option. A fresh grind of meats gives you the right balance of texture and flavor and the confidence that your resulting burger will come off the grill ready to impress your guests! TIP: Grinding bacon that is slightly frozen allows it to mix well, rather than stick to the grinder blades. Next, you need to form the perfect patty. Of course you can use your hands, however there are other ways. A burger gets tough and chewy the more you mix and work the meat into a patty. Forming a simple ball and using the Burger Press to flatten it helps with this common problem – and better yet, it automatically adds the dimple to avoid puffy burgers! Plus for kids who don’t like getting messy with raw meat (I have one of those! ), using the press is an easy for them way to get involved. In Weber’s Big Book of Burgers, there is a wonderfully simple recipe that will please everyone’s palate, kids and adults alike. It’s the sweet and spicy Bronco Burger that gets its kick from cumin and chile powder and its sweet from an amazing Cherry Cola Barbecue Sauce. Finished with crunchy onions, pickles and smoked mozzarella, this juicy, flavorful burger has become one of our new favorites! Do yourself a favor and grill a burger. 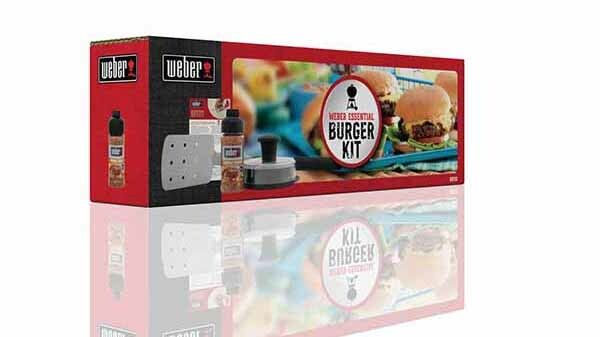 However instead of pulling your hair out trying to figure out which ones to make, pull out the Weber Essentials Burger Kit to help get you started. Get your kids involved by flipping through a cookbook or browsing online recipes. Most importantly have fun creating something together and with the first bite, it will be a magical backyard hero memory they will remember.